Parenting It's not just hormones: What’s really happening in the minds of teenage girls? The following is an excerpt from the book Untangled by Lisa Damour, Ph.D. When I was in my first semester of graduate school, the professor teaching my psychological testing course handed me a stack of Rorschach inkblot tests to score. Before sending me on my way, he offhandedly said, "Double-check the age of the person whose test you are scoring. If it's a teenager, but you think it's a grown-up, you'll conclude that you have a psychotic adult. But that's just a normal teenager." Twenty years later, I don't need to score inkblot tests to know that healthy teenage development can look pretty irrational. Parents tell me about it every day. They describe how a minor annoyance – such as when a girl finds out that the jeans she wants are still riding out the rinse cycle – can turn into an emotional earthquake that knocks everyone in the house off balance. 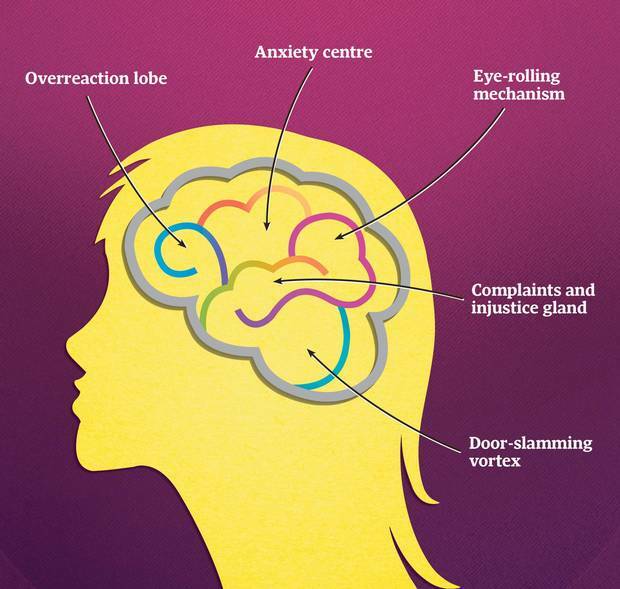 The sudden force of a teenager's feelings can catch parents off guard because, between the ages of six and 11, children go through a phase of development that psychologists call latency . As the term implies, the mercurial moods of early childhood simmer down and girls are pretty easygoing until they become teenagers and their emotions kick up again. Recent developments in brain science offer new insight into why latency ends when it does. Though we used to assume that the brain stopped developing somewhere around age 12, we now know that the brain remodels dramatically during the teenage years. The renovation project follows the pattern in which the brain grew in the womb. It starts with the lower, primal portions (the limbic system) then moves to the upper, outer areas (the cortex), where the functions that separate humans from other animals live. Updates to the limbic system heighten the brain's emotional reactions with research indicating that the feeling centres beneath the cortex are actually more sensitive in teens than in children or adults. For example, one straightforward study used functional magnetic resonance imaging to watch teenage brains respond, in real time, to emotional input. The research team showed images of fearful, happy and calm faces to children, teens and adults while monitoring the activity of the amygdala, a key player in the emotional reactions of the limbic system. Compared to the brain activity of children and adults, the teens' amygdalas reacted strongly to fearful or happy faces. In other words, emotional input rings like a gong for teenagers and a chime for everyone else. With the lower-to-higher remodelling of the brain, the frontal cortex – the part of the brain that exerts a calming, rational influence – doesn't come fully online until adulthood. This means that limbic system reactions outstrip frontal cortex controls. Put simply, intense emotions burst through and introduce you, and your daughter, to a new period of emotional upheaval. Adults often tell teens that their feelings are at full blast because of "hormones." This usually doesn't go over very well, plus it's probably inaccurate. Despite the obvious coincidence between the beginnings of puberty – with its acne, growth spurts, and dawning smelliness – and the intensification of your daughter's emotions, research suggests that the impact of pubertal hormones on teenagers' moods is indirect, at best. In fact, studies find that hormones respond to, or may even be trumped by, other factors that influence your daughter's mood, such as stressful events or the quality of her relationship with you. In other words, the changes in your daughter's brain and the events that occur around her are more likely to shape her mood than the hormonal shifts occurring inside of her. Here's the bottom line: What your daughter broadcasts matches what she actually experiences. Really, it's just that intense, so take her feelings seriously, regardless of how overblown they might seem. Parents who are surprised by their daughter's dramatic ups and downs can lose sight of the fact that she is pretty shocked, too. So if your teenage daughter is developing normally, you are living with someone who secretly worries that she is crazy and who might have the psychological assessment results of a psychotic adult. And we might as well add that you are living with a girl whose key support system – her tribe – consists of peers who are also as reactive and erratic as they will ever be. Your daughter works hard every day to harness powerful and unpredictable emotions so that she can get on with doing everything else she means to do. To manage all of that intensity and to keep from feeling crazy, she'll recruit your help. Depending on the moment, she might ask for your support directly, she might unload her feelings on you or she might find a way for you to have a feeling on her behalf. Sometimes you'll recognize the role you are being asked to play, other times you'll only appreciate your part in retrospect, if at all. Understanding your daughter's efforts to harness emotions will allow you to maintain your sanity while you're busy helping her feel confident in her own. Teenagers often manage their feelings by dumping the uncomfortable ones on their parents, so don't be surprised if you find that the arrival of adolescence comes with a surge in complaining. No parents enjoy listening to their daughter's endless stream of complaints, but it's a lot easier to stand if we appreciate that her griping serves a valuable purpose. Complaining to you allows your daughter to bring the best of herself to school. Instead of being rude or aggressive toward peers or teachers at school, your daughter contains her irritation and waits until she is safely in your company to express it. If she can hold it together all day at school, you might wonder why your daughter can't hold it together a little bit longer so that she can also be pleasant with you. As it turns out, willpower is a limited resource. By the time they get to the end of the day, there's just no energy left to contain their annoyance, and the complaining begins. Girls who get a chance to talk about the abundant frustrations of their day usually feel better once they've unloaded their distress on you. Any adult who has spent dinnertime grumbling about a co-worker, neighbour, or boss understands that sharing one's true feelings at home makes it a lot easier to be charming out in public. Teenagers are no different. Having used you as their emotional dumping ground, they are prepared to return to school and play the part of the good citizen. Indeed, they may be able to act as a good citizen at school precisely because they are spending some of their time imagining the colourful complaints they will share once their school day has ended. When your daughter complains, listen quietly and remind yourself that you are providing her with a way to unload the stress of her day. Many parents find that they want to do something as they listen to their daughter's distress – to offer advice, point out their daughter's misconceptions, make a plan to address her troubles, and so on. Do not feel pressed to solve your daughter's problems; you've probably tried and already found that she routinely rejects your suggestions, even the especially brilliant ones. If you really want to help your daughter manage her distress, help her see the difference between complaining and venting. Complaining generally communicates a sense that "someone should fix this," while venting communicates that "I'll feel better when someone who cares about me hears me out." Most of what teens complain about can't be fixed. No magic wand can make her peers, teachers, coaches, locker location, or homework any less irritating. Better for her to do a little less complaining about such realities and a little more venting. In doing so, she moves away from the childlike idea that the world should bend to her wishes to the adult idea that life comes with many unavoidable bumps. When she starts rolling out the complaints, consider asking, "Do you want my help with what you're describing, or do you just need to vent?" If she wants your help, she'll tell you. Even better, she might take your advice having actually asked for it. If she wants to vent, she'll tell you and you can sit back and know that just by listening you are offering meaningful support. More important, she'll start to learn that sometimes, just by listening, you are providing all the help she needs. Your daughter may be suspicious of your motives the first time you offer her the opportunity for unbridled venting. If she has grown used to getting (and, of course, reflexively rejecting) your advice when she complains, she may wonder what you're up to. But stick with it and be clear that you believe in the healing powers of "just venting." Soon, she'll come around. Don't expect that venting will – or should – fully replace complaining. But do take advantage of opportunities to help your daughter distinguish between problems that can and should be solved and problems that are best addressed by sharing them with someone who cares. If the content of your daughter's venting strikes you as totally unfair and you feel compelled to weigh in, consider saying, "I have a different take on the situation. Do you want to hear it?" Should she say yes, carry on. Should she say no, bite your tongue and find comfort in the knowledge that your daughter is now aware that she shouldn't mistake your silence for a tacit endorsement of her views. Congratulate yourself when you can get your daughter to advance to venting, because there will be times when you won't even be able to get how she expresses her displeasure up to the level of complaining (much less venting). These are the days when she simply takes out her annoyance on anyone in her path – a particularly unpleasant, and common, form of using you (your other children, or the family dog) as an emotional dumping ground. If your daughter feels that she must punish your family for her bad day, you might let one or two cutting comments pass. But, if it becomes clear that she plans to be wretched all evening, go ahead and say, "You may not be in a good mood, but you are not allowed to mistreat us. If you want to talk about what's bugging you, I'm all ears. If you're going to be salty all night, don't do it here." Your adolescent daughter doesn't wake up one day and say to herself, "I think I'll start handing off my uncomfortable feelings to my parents." The decision to use externalization for emotional relief occurs outside her conscious awareness. Unconscious processes can be powerful. If we could hold up a microphone to your daughter's unconscious mind, it would say, "You know, I've had a long day of being upset about this poor grade I just got back – the whole thing has become exhausting. I don't have a solution to the problem, but I need a break from being upset. I'll leave the test where Dad will surely find it so that he can be upset about it. Now, he might try to get me to remain upset about this grade, so I'll tell him he's overreacting and walk away – that should keep the upset feeling in his lap and out of mine for a while." Externalization happens when your daughter wants to get rid of an uncomfortable feeling. And not just anyone will take on her uncomfortable feeling; it has to be someone who really loves her. Externalization is a profound form of empathy. It goes beyond feeling with your daughter to the point of actually feeling something on her behalf . When teens complain, they own their discomfort, will often accept your empathy, and may even allow you to help them address the source of their misery. When they externalize, they want you to accept ownership of the offending feeling and will prevent you from giving it back. It's the difference between "Mom, I want to tell you how uncomfortable this very hot potato I'm holding is and see if you've got any good ideas for how I might manage it" and "Mom, take this hot potato, I don't want to hold it any more. And hang on to it for a while." Externalization is a strange and subtle process that helps make adolescence manageable – for your daughter. Teenagers spend the better part of their time with peers who are also trying to harness their emotions and may not be able to offer useful support. Put another way, how do you get your best friend to take your hot potato if she can barely manage the potatoes she's already got? When teenagers feel overwhelmed by their feelings and need to do something, they find a loving parent and start handing out potatoes. Lucky for your girl, but not so lucky for you. Parents on the receiving end of an externalization often don't know what hit them. For the most part, there's not much that you can do about externalizations. You will rarely, if ever, be able to identify an externalization at the moment it occurs. And talking with your daughter about her behaviour won't prevent her from doing it. Teens don't consciously decide to externalize, so they can't consciously decide not to. The process unfolds as rapidly for her as it does for you. Even if you could talk your daughter into taking responsibility for all of her difficult feelings all of the time, would you want to? Your willingness to hold your daughter's emotional hot potatoes from time to time is a thankless and charitable act, but it will help her get through some of the roughest patches of her adolescence. Given the opportunity to unload their discomfort, most teens will gather their resources and work through what went wrong, or discover, with the benefit of time, that the problem comes down to size on its own. If you find yourself compelled into radical action after a brief but painful encounter with your daughter, I've got two words for you: do nothing. Though a teenager will experience her fight with a friend as a full-blown crisis, it's our job as adults to remember that it's not. Talking with a trustworthy adult about what's happening with your teenager is usually the perfect salve to the discomfort of being on the receiving end of an externalization. By sharing the situation with someone who isn't holding an emotional hot potato, most parents start to see things more clearly and to regain an adult perspective on the problem. Sometimes another adult isn't available or the content of the externalization feels too sensitive to be shared. Under these conditions – and absent pressing safety concerns – wait at least a day before taking any action. Waiting gives the hot potato time to cool and gives you and your daughter time to craft a rational plan. And you'd be surprised by how rarely a plan even needs to be made once some time has passed. From the book Untangled by Lisa Damour, Ph.D. Copyright © 2016 by Lisa Damour. Reprinted by arrangement with Ballantine Books, an imprint of Random House, a division of Penguin Random House LLC. All Rights Reserved.